The wedding I was at last weekend in Calgary was all about the food. It was a small wedding and they closed down an Italian restaurant for the evening to hold the wedding. The ceremony was held on the terazzo which was lovely. Then we all went inside for dinner. We ate from 6:30 until 10:00. I am not kidding. It was served "family style" with no less than 10 appetizers, 3 pasta dishes, 3 main course meat dishes with several side dshes of potatoes and vegetables. Dessert was served later out on the terazzo again, with several choices. It was amazing food and sooooo good. I love cooking and it totally inspired me to get home and start cooking and since I'm on holidays from the day job I have time for that! Sometimes cooking meals during a busy week can be a chore but during my holidays I plan to try out new recipes. Tonight, inspired by the wedding, I'm making some "small plates" for dinner including tapenade on crostini, bruschetta, Caprese salad and marinated artichoke hearts baked with Gruyere cheese. Because I like to cook and I often include food in my books I thought I would start sharing some of my recipes, especially ones that appear in my stories. I you look up on the right sidebar you'll see a new link to Kelly's Recipes, where I will add recipes every week. Hope you'll come back and check them out and maybe try them! 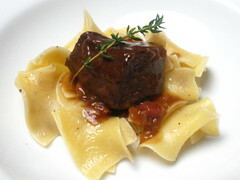 The picture above is Beef Carbonnade, which Zach makes for Ashlyn in my book Dream Girl.